We're hosting our first real Thanksgiving this year, where more than two friends come over and I can finally stop being the person looking for the smallest turkey in the store. To celebrate such a big occasion, instead of gifting you with a drool worthy recipe for pie or casserole...you find a kale salad. I swear I'm not a party pooper, a good kale caesar is the cure to all of life's woes. And if you're looking to sneak some greens among all the carbs, butter, and sweets on thursday, the kale caesar is here for you, here to save the day. This salad has been a part of our weekly repertoire for a while now, ever since we discovered the wonder that is homemade caesar dressing. But we didn't discover just how good it could be until we were dining in this tiny restaurant called El Rey on a friday night, ordered their kale salad, and reveled in how tender the leaves were. The key, we learned, was massaging olive oil into the leaves before assembling, covering every crevice and surface with a thin layer, working it in with your fingers, to turn the kale from tough and fibrous to tender and silky in just a few short minutes. Massage: done, now let's talk homemade caesar dressing. If you've never made it before I'm here to assure you though it takes a bit of arm work, it is otherwise quite simple. You make a paste out of anchovies, garlic, and sea salt. 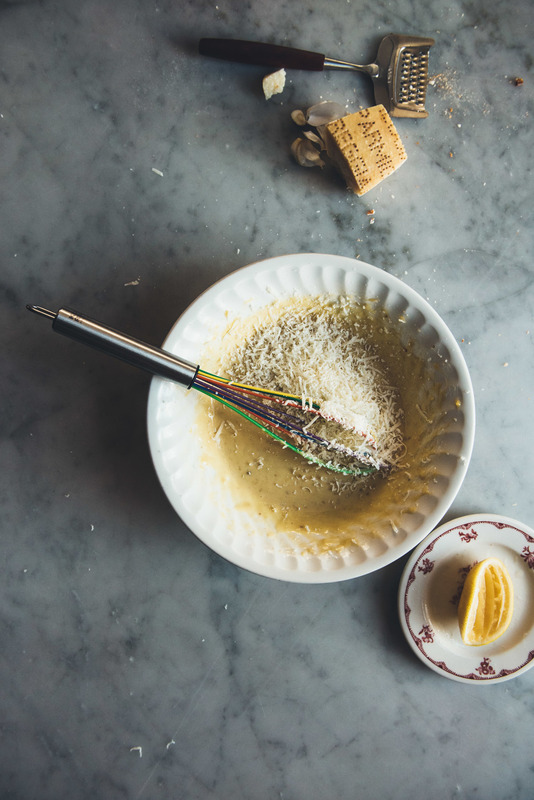 You mix the paste with mustard and egg yolks, you whisk in oil slowly to create an emulsion, you add lemon juice, parmesan, mix everything together, and voilà. I have both a fond and embarrassing memory of my first ever taste of caesar dressing at some fast food joint as a kid. I had told my equally clueless dad that I wanted to order the 'kai-ser' salad wrap and he proceeded to have a confusing back and forth with the man behind the counter until we finally just pointed to the item pictured on the menu board. "Oh! You mean see-sar!" And all was understood. To think I've gone from ordering fast food kai-ser salad wraps to an olive oil massaged kale salad with homemade caesar dressing (yes I realize how ridiculous that sounds), it certainly seems I've come a long way. All sarcasm aside I really did love that first wrap as much as I love this salad today. Though it would definitely have been tastier with some freshly made caesar dressing. Heat the oven to 400 degrees F. Slice or tear the bread into bite sized pieces and transfer to a large baking sheet. Coat the pieces lightly with olive oil, salt and pepper. Make sure the bread is in one even layer and transfer to oven to toast for 10 to 12 minutes, or until lightly golden and crispy. Remove from oven and let cool. In the meantime, mince the anchovies, garlic, and sea salt together. Scrape and mash the mixture with the blade of your knife along the cutting board until it starts coming together as a paste. Transfer anchovy paste to a medium mixing bowl. Add egg yolks and mustard. 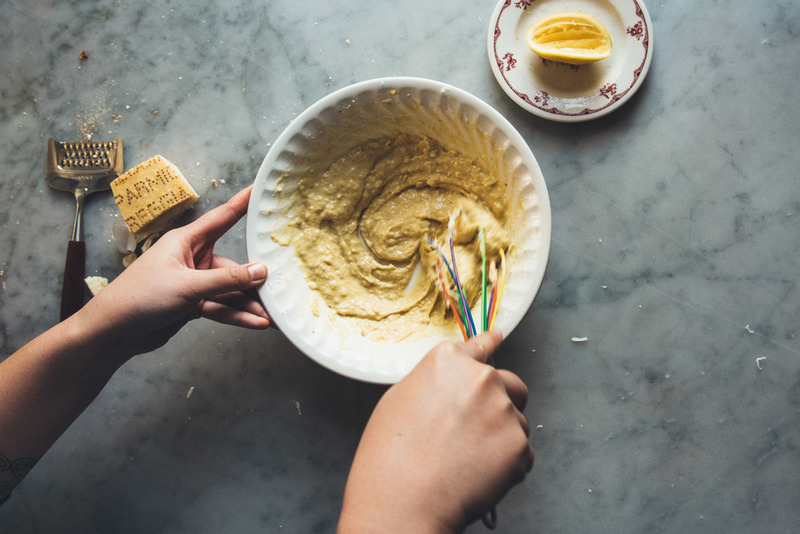 Whisk to combine, then start very slowly drizzling in olive oil while continuously whisking, you're looking to create an emulsion. Once the olive oil is finished, do the same with the neutral oil. Add the lemon juice and whisk to combine. Taste and add more lemon juice as needed. Mix in the parmesan, then set aside until ready to use. If not using immediately, transfer to a sealed jar and store in the fridge. To assemble, place kale in a large salad bowl. Drizzle with 2 tsp olive oil and work the oil into the kale with your fingers. Make sure to coat as much of the kale as possible, this will help tenderize it. Add croutons and dressing and toss until evenly coated. Taste and add more dressing as desired. Top with grated parmesan. Serve immediately and enjoy.